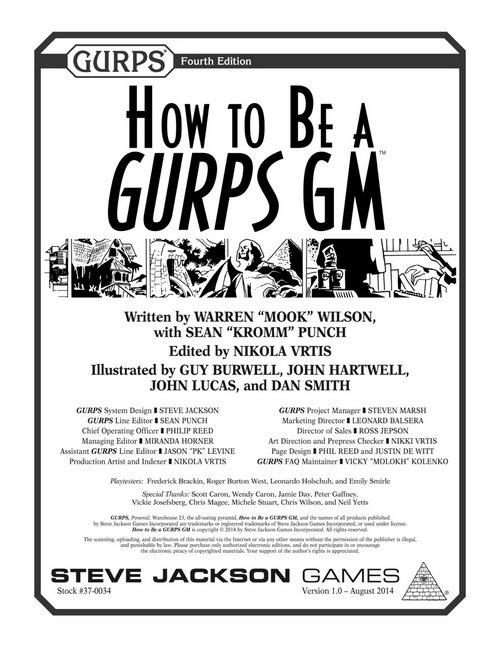 Anyway, How to Be a GURPS GM is a kind of treatise on how to make sense of a system that has matured for well over a decade now, with lessons learned from people who have been playing and writing GURPS content for even longer than that. It has guidance on all things Game Master, and I will say, as someone who loves reading books about rules, even though that is the exact opposite of what this is about, is probably one of the most valuable supplements I have. I feel like "guidance" and "advice" sound like weasel words that do a disservice to describing the content of this book. 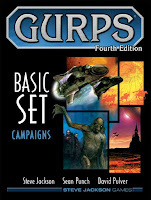 Truly, everything in the book is optional, and there are no hard and fast rules, but that is true of every GURPS book which is one of the lessons imparted by the book. The book includes "generic advice" that works for almost any role playing system, but tempered and geared towards GURPS while including many GURPS specific nuances. fluffy cousin to this book. I feel it important to note that the game uses a fictional cast of characters allegorically to represent a GM and players at various levels of experience. Marcus is a GM experienced with RPGs, but new to GURPS; Anne is a very experienced player who has played several RPGs including GURPS; Peter is a novice, but understands the fundamental trappings of RPGs; and Josh is a completely new player. The book has a format where you have advice given in one part, and application of that advice by the cast of characters in another. Having side by side examples are pretty helpful and really help when trying to learn a new system. I really appreciate that the examples are in large contiguous sections instead of bits and pieces throughout like I've seen in some other books. It makes finding the examples that I want really easy, and it helps me with remembering the meta-storyline better than the "paragraph of rules, few lines of examples, back to rules, and now a snippet of the example again." Subtracting miscellany from the front and appendices from the back, you have 62 pages of content split across 7 chapters. The first 12 page chapter is about developing the framework or architecture of your campaign with sky high levels of general details. This is then paired with a 5 page example of going through those motions. The next 9 page chapter describes how to create an adventure, and this too is paired with a 3 page example chapter. 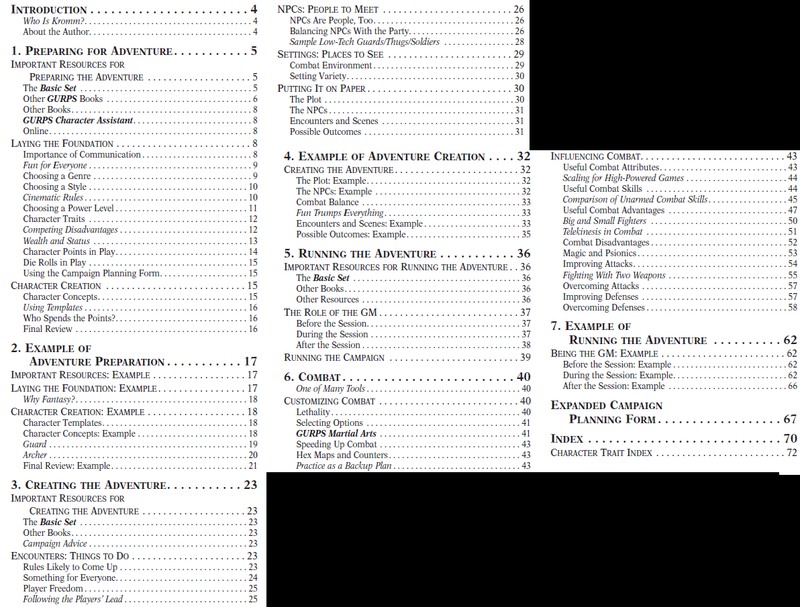 The one slight aberration for the pattern occurs with chapters 5-7, where chapter 5 is 4 pages of advice on running an adventure, chapter 7 is a 5 page example, and in between we have a 19 page chapter on Combat. Does this upset the flow of reading? A little, but it is quite a minor point I think. 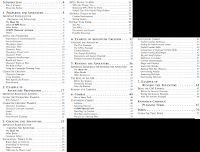 The book ends with two appendices: an expanded version of the campaign planning form from the Basic Set, and a special index for a section on trait recommendations. My only small suggestion for the index is that it would be kinda neat if the references were hyperlinked to the respective pages, but ah well! It's not a show stopper. 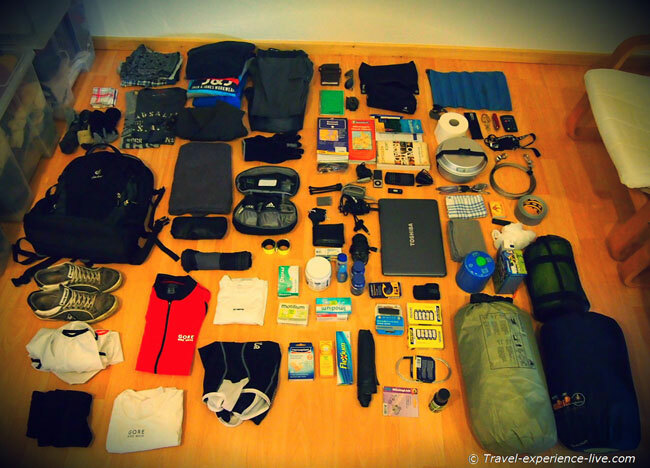 This chapter talks about the kinds of things that should be considered before preparing an "adventure." 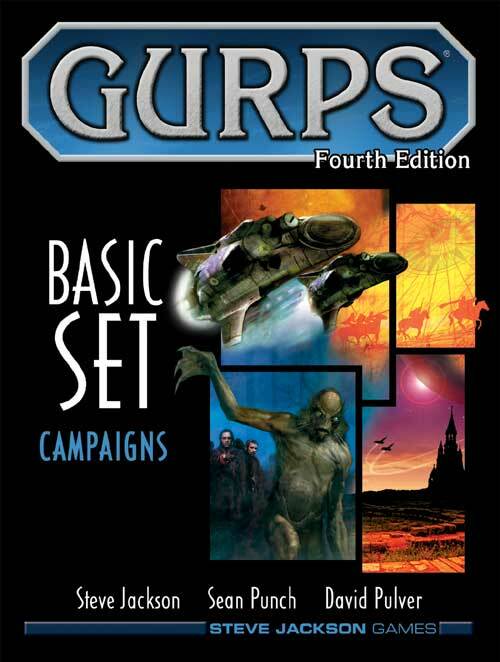 In GURPS parlance, the adventure is probably the second biggest unit of playability, with a "campaign" containing many adventures, and a "one-shot" typically being one adventure. What this means is that this preparation is a iterative process that is repeated many times. I note this because I think it's interesting that this chapter and the example are really kind of more preparation for what I would call the "campaign" rather than the "adventure," but words, right? What you call an Adventure, Saga, Epic, Module, Quest, Campaign, etc. isn't too important, and I'm not even sure if there is a literal GURPS definition of these terms, but if I were to rename chapters 1 and 2, I'd spell out that the content is more for the preparation of a "campaign" than an "adventure," if those words mean what I want them to mean. The chapter begins with a short bibliographical reference detailing specific chapters or books that might be useful to a GM, and some guidance on how to choose books to peruse before setting up a campaign. The next section, Laying The Foundation is a look at getting together all the fundamentals of a campaign, and has a good mix of anecdotes, "soft" advice, and specific mention of GURPS metrics and mechanics to be wary of. Some of the advice is similar to what is given in Basic Set - Campaigns but How to Be a GURPS GM goes far deeper and wider than the treatment given there. Questions like, What do you want to GM, what do your players want to play, how do you cultivate the right slice of GURPS for your vision of a fun campaign? As an aside here, the book is full of editorial asides that aren't as common in other books, but they are a nice way to break up the pace and I feel like they helped keep me more engaged. I can get why maybe they aren't desired in all the books, but I personally like them, especially with this very mechanically light style of material where clinical professionalism isn't warranted. The chapter finishes with a section on Character Creation which explains some of the intricacies and unique assumptions of GURPS, and gives guidance on what some people consider one of the more intimidating aspects of the system which is the character creation. It discusses strategies to make it easier, create a cohesive team, and giving players the right amount of freedom while giving them the right kind of bounds to be productive in producing a character. The chapter is laid out well in a reasonable order, and everything makes sense the way it is done. If I have any criticism besides nomenclature of the title, it is in the subjective space that I think some things have too much detail sometimes. I think that criticism comes from a place that depends on how well you understand the system. When I read How to Be a GURPS GM I had never played an rpg before, so the verbose clarifications were definitely appreciated. Now, revisiting it with a little bit of experience, it isn't a real problem, but sometimes it seems hard to find the thing I want because it is drowning in the examples. That being said, it is still a good enough resource that I still do refer back to it. This chapter follows the fictional characters described earlier as they work together to set up a campaign and the characters. Even if it seems a bit unrealistic how easily problems are solved, I enjoy the dialogs between the players as they hash out different issues and what they are looking for in a game. The chapter does well to exhibit many of the different strategies detailed in chapter 1, for example, two of the players decide to use templates that the GM has come up with, and the other player decides to use a collaborative creation technique to put a character together. I also like how the problems worked through are somewhat realistic from my experience, even if the resolution is a lot smoother than I've ever seen in real life. The one weird thing to me is that there is a bit of an aside with guidance in a chapter that is to be an example, but it does put it in an area that is relevant, so it does make sense all in all, but might make it harder to find if someone were to want to find that passage again for reference. If the first two chapters were about making the universe, this and the next chapter are about making a pie from scratch. This chapter highlights the more iterative preparation activity that a GM is likely to perform for each and every session. It goes above and beyond simple statements of "make the campaign fit the characters" with lots of examples of how to actually do that. What kind of challenges can I add to make this fun for the player who is a detective but with a phobia of cats? What kind of plot hooks should I expose for the face guy? How do I break up the monotony of battle -> battle -> battle? That's the kind of problems this chapter discusses. The next section on NPCs is also pretty good, but I think the preparation advice given for balancing is a bit too laborious. 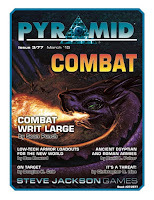 If you read my blog a lot, you can tell I am very dedicated to the CER mechanics introduced in Pyramid #3/77, but that isn't to say that the advice is bad; just that I think if you want to buy something for the sole purpose of balancing fights, get the combat issue of Pyramid instead. That said, the advice on how to diversify combat and the settings is very useful and gives you a lot of unique situations to play with. It ends on a section on strategies to organize thoughts on the challenges, npcs, and locations a player will encounter and how to flesh it out, and what kind of results to anticipate. This chapter, as with the whole book is organized pretty well, but the lines kinda blur between the concept of an encounter, an enemy, and an NPC a little. Perhaps if the combat information from this chapter was pulled out of here and put into the later Combat chapter it would be a tad bit better? Sometimes these blurred boundaries are unavoidable in any case though, and it does show how well one topic leads into another. Like the previous even numbered chapter, this one is also an example of the previous chapter put into practice. Marcus goes about the job of building an adventure on his lonesome, applying all the lessons learned. Nothing remarkable to say, but that it is well written and makes sense. As the title describes, this chapter is about the actual execution of a session. It is very short, but it covers everything it needs to. It gives advice on how to be flexible, make sure your players enjoy themselves, and that you also enjoy administering the adventure. I especially appreciate the advice on how to link one adventure to another. Probably one of the softest chapters in the book with everything simply coming across as suggestions, but that may be because when everything else is taken care of, there isn't much left to do to make a session go well that isn't completely subjective. This chapter is about customizing and right-sizing combat for the scenario in your game or all combat in the campaign in general. I especially enjoy the listing of all the combat options on the Speedy - Realistic continuum, and I'd almost be happy to see continuums like this for other aspects of GURPS, but it is hard to think of anywhere it might actually be useful besides social engagement. The chapter goes into detail on several important skills and advantages and how they interact with the combat system, and the special nuances of things like the difference between boxing and brawling, or wrestling and judo. It is the longest chapter in the book, but I don't have much to say about it. It is a large amount of information and all of it is good information. The one thing I can say though is it almost doesn't seem like it belongs in this book. It seems more like a help for new players than for GMs. 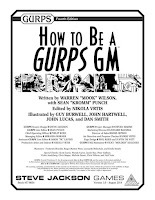 I repeat that the information is really good, but a majority of the chapter is more like a guide on how to fight good in GURPS rather than guidance on how to make fights good in GURPS, not that the two concepts are entirely divorced. This example is really useful and great for anyone new to GURPS, player or GM alike as it explains the kind of thoughts and how play goes in a normal session. The only unrealistic thing in the chapter is how Marcus is able to get really good advice from his players just by asking for it. Someone should write a guide on how to force your players to tell you what they liked and didn't like. This chapter is great and the exposition explaining the rules as the situation unfolds makes it almost "The example that Basic Set needs, but didn't include." The Expanded Campaign Planning Form is a neat idea, but it isn't especially useful in its raw form. and I wonder if it was designed like that on purpose? The fields are way too small, and it isn't formatted in a convenient way to support printing multiple pages of sections that might need to be filled out multiple times. What is good about the form though is that it asks you many of the questions you should at least consider when designing a campaign. The author has made a fillable version of the original form from the Basic Set though. The book also contains an extra index dedicated to all the skills, advantages, attributes, etc. separate from the regular index. I do not know if it helps any more that way, but hey, you have two indices instead of one. This is a good book, and it is definitely worth getting. Most of my criticisms are pretty trivial, like the fact that the Combat chapter feels a little bit out of place (Like, the book should be called, How to Be a GURPS GM, and Oh, Here, Some Extra Stuff So You Can Fight Good Too.) I mean, it's great content, and the very first section of it is pretty good GMing advice, but that chapter just sticks out! I'm going to tell you guys a shocking secret right now. I'm an RPG newbie. I've been playing RPGs since January 2015, and of that time span, it has been mainly GURPS, with very brief forays into other systems. I own manuals for Ryuutama, Burning Wheel, and Dread. I picked them up either because the aesthetic attracted me, or because of the gushing over the alternative mechanics. In any case, there is a meme that GURPS is especially difficult when compared to other popular systems. I feel like this word is not exactly on the money, but the precise descriptive word eludes me. The math isn't really as tough in play as some would have you to believe, the amount of dice rolling isn't particularly bad, and exceptions to the core mechanics are far and few between. This book was the very first GM guide book I bought for any system... if you don't count Basic Set - Campaigns. The book was immensely helpful to me then, and is still a great reference to me today. I like the idea of calling it GMRPS. It doesn't roll off the tongue the same way, but it is definitely much truer. I've been playing GURPS for about a year, and GMing for a short time and I've found that most of the time, players are happy to just hear what they have to do. That means as GM, I can just pick whatever rules I like, and then simply decide the rest myself! E.g. when an ax hits an enemy, where does it land? I could roll for it, or I can simply rule where the most dramatic place is.